We are one month into the 2018-19 NHL season and, at the time of writing, the Vancouver Canucks are leading the Pacific Division and are only two points behind the Western Conference and NHL-leading Nashville Predators. Yes, you read that right. Considering the entire league had the Canucks pegged as a basement team, this is quite the shock. It’s also even more impressive if you look at the team’s injury list so far this season — a handful of key players have already been sidelined. How is this possible? I’ll give you a hint: it starts with Elias Pettersson and ends with Brock Boeser. The young Swede has nine goals and 15 points in his first nine NHL games and has already put himself in the Calder conversation. The 19-year-old was the Canucks fifth-overall selection in the 2017 NHL Entry Draft but people questioned whether or not he’d be able to transition from the international ice to the North American and smaller surface. Skeptics thought that that transition, coupled with his skinny 6-foot-2 160-pound frame, would make him ineffective in today’s NHL. “He’s (Pettersson) really impressive. He plays the game in a way that you can’t really compare him to other players. He can do it all. The way he sees the ice and understands the game, I think that comes from playing in the top league in Sweden (SHL) last season against men.” – Henrik Sedin, Canucks legend. Pettersson shredded the SHL, breaking records of NHL legends along the way. He’s also put on weight and is now hitting the scales with about 175 pounds. However, he’s still quite light for the NHL and it was definitely a factor in his unfortunate altercation with Florida Panthers’ D-man Mike Matheson that resulted in a concussion for Pettersson and a suspension for Matheson. Thankfully, he bounced back even stronger and in the wake of the aforementioned injuries, lines were jumbled and he found himself with a new partner in crime. 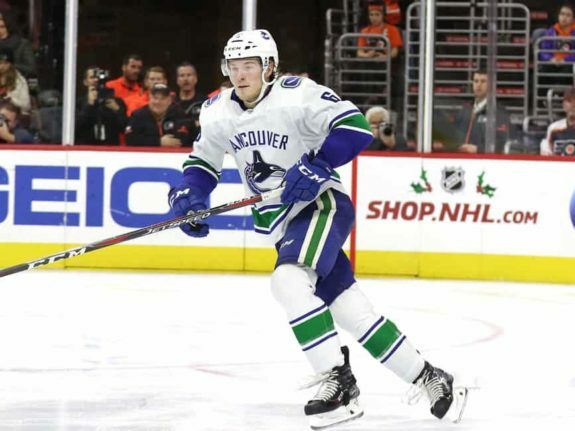 Brock Boeser: Back to Business? If your memory is a little foggy, Boeser was essentially in Pettersson’s shoes last season — he was a Calder candidate with 29 goals and 26 helpers in 62 games. He lost the race to Mathew Barzal of the New York Islanders, largely due to the fact that he had his season cut short by a rough back injury. After a long summer of rehabilitation, people weren’t 100% confident in Boeser’s ability to bounce back, especially considering he got heavier in the offseason and looked slow in preseason action. It was a slow start for Boeser, putting up only two goals in the Canucks first 12 games — he has 11 points in 13 games but just hasn’t had the scoring touch he had last season. However, in the Nov. 2 clash with the Colorado Avalanche, we saw shades of last season’s Boeser. The Burnsville, Minnesota product found twine twice and seemed to have a jump in his step that was non-existent through the first 12 games. In the past few contests, coach Travis Green started rolling with Pettersson, Boeser, and Nikolay Goldobin on the first line and they’ve looked extremely dangerous together. Pettersson & Boeser: Next Great Duo? Sedin to Sedin off the boards. Pettersson to Boeser off the boards. “He’s going to have to pay us! We have copyright for that play and you can’t just steal it.” – Henrik Sedin told Sportsnet after watching the play. That was the second of two assists Pettersson had on Boeser’s goals in that previously mentioned Nov. 2 game. The first one was a breakaway feed that Boeser capped off one minute into the game. For those who didn’t watch the game, it was a nail-biting 7-6 overtime win for the Canucks — Pettersson finished with two goals and three assists, Boeser had two goals and two assists and Goldobin finished with two helpers for a combined total of 11 points. This game was a pure showcase of the Canucks’ future and boy oh boy, was it ever exciting. 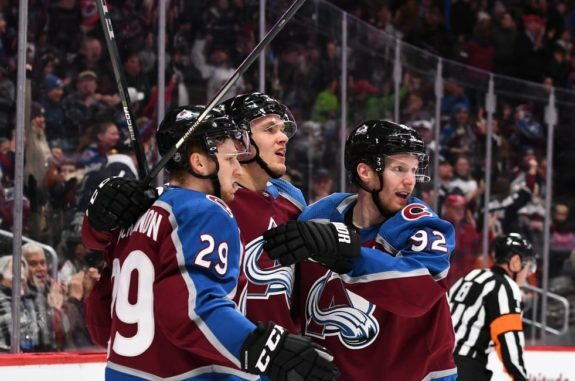 Perhaps what was most impressive, was the fact that this young line stood toe-to-toe and went shot-for-shot with the best line in the NHL in the Avs’ Nathan MacKinnon, Mikko Rantanen and Gabriel Landeskog, who combined for seven points on the night. To paint a picture, the Avalanche’s big guns have combined for a league-leading 63 points in just 14 games — that’s the same amount that the entire Los Angeles Kings’ roster has in 12 contests. One can only hope that the performance shown against the Avs is going to be the first of many, but all signs are pointing towards that being true. Pettersson is undoubtedly an elite NHL talent and playing him alongside a pure sniper like Boeser is incredibly promising. Boeser also seemed to have his legs under him for the first time this season — he was winning footraces, and considering that both of his goals were on partial breakaways, you can’t help but feel okay with his speed. If I’m being honest, I was pretty concerned about his speed through the first dozen games. 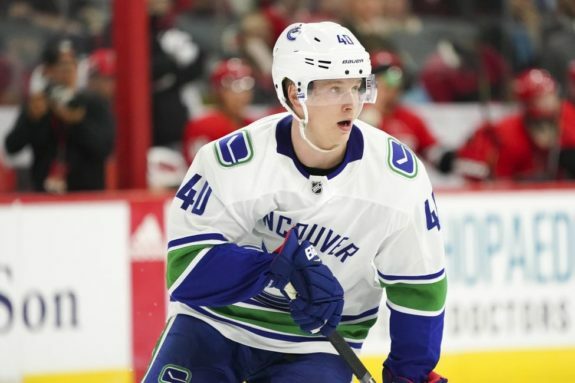 What do you think about the Boeser and Pettersson connection? Is the Bo Horvat and Boeser connection stronger? Let me know in the comments down below!